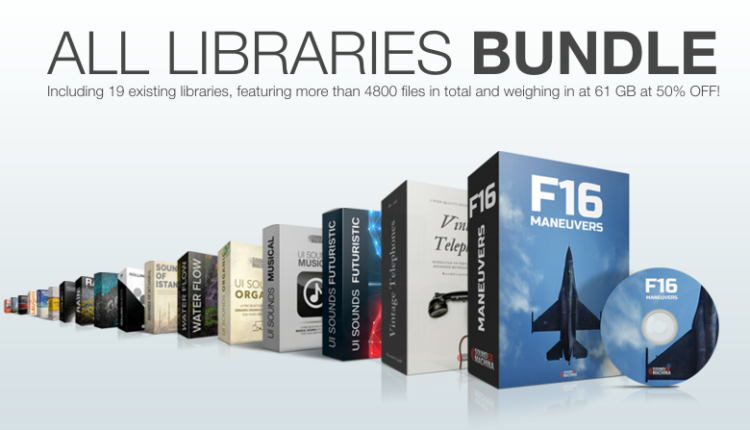 All Libraries Bundle is a collection of 19 libraries featuring more than 4800 files in total and weighing in at 61 GB. It is an opportunity to purchase 16 libraries at a 50% DISCOUNT. 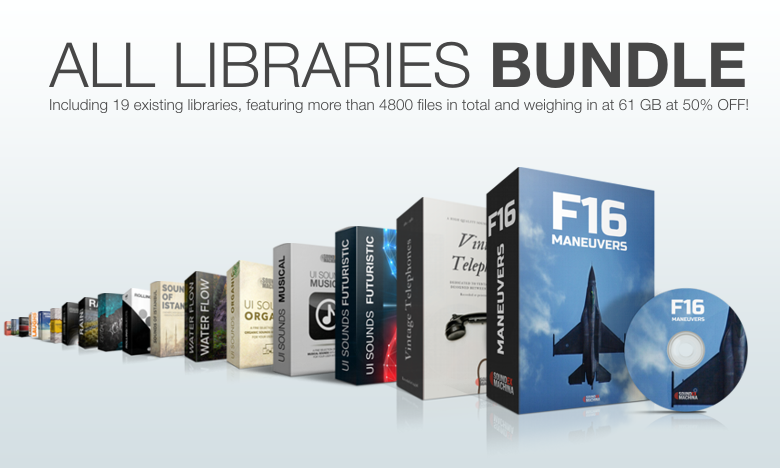 The F16 Maneuvers library features 36 recordings of F16 Fighter jets, captured at three different locations from the ground perspective. 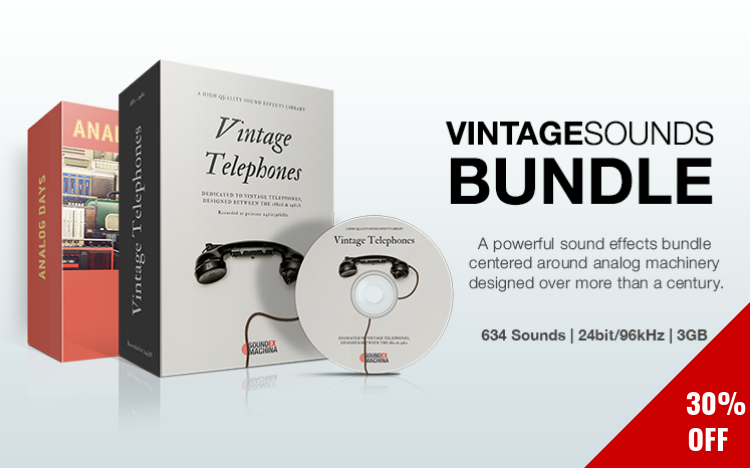 Vintage Telephones SFX library contains 244 sounds extracted from 10 historic, rotary dial devices designed between the 1880s and 1980s. Inside, you’ll find three common ringing patterns (used in the USA, Australia, and Europe) for each telephone type, handset pickups/set downs, number dials 1-0, hook toggles, as well as single ringings to design your own ring timings according to your project needs. Endless Drones is a diverse set of 100 multi-layered atmospheres and mangled drone textures, that will help you portray an unsettling sense of mood or establish a unique sense of location in your projects. Scratches library is a comprehensive collection of 700 recordings of scrapes, cuts, scuffs, peelings and rubs. 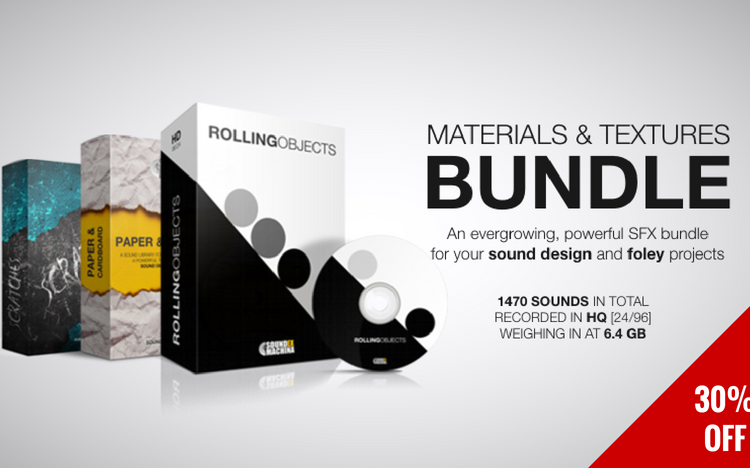 This high-quality collection of versatile sounds will make skin crawl and hairs stand on end. The Mediterranean Summertime SFX library includes 120 selections dedicated to life and the atmosphere of both glitz and off-beat Mediterranean islands, during summertime. 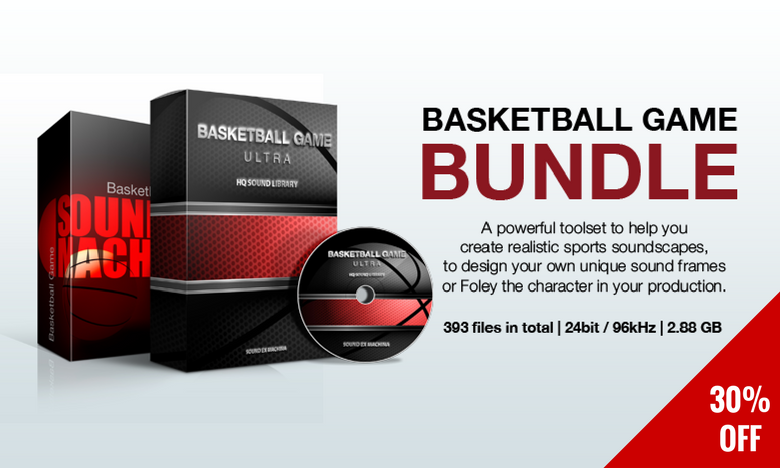 Basketball Game Pro is a sound effects library thematically centered around a basketball game, and is suitable for your audiovisual and app productions. All sounds have been recorded in a real basketball match and are delivered at 24bit/96kHz, in an easily downloadable .zip file. The collection includes several versions of game air horns, crowd applause, attack, defense, fault, score and lost opportunities ambiences, referee whistles, crowd boos & yells and a short warm-up game ambience. The library contains only the interjections, purposely avoiding a specific language identity, making it more flexible and suitable for universal use. Animal Farm is dedicated to most popular farm animals, rural ambiences and agricultural activities – all you need around farm life. 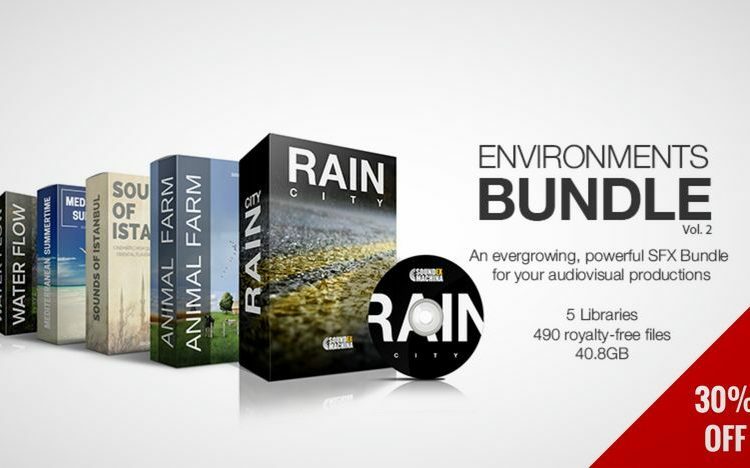 It features 165 sounds in total, from 14 different species with multiple variations for each animal, 25 discreet rural ambiences and 10 types of modern and traditional agricultural activities. This library contains oriental-flavored soundscapes gathered around Istanbul, Turkey. It features calls to prayers, bazaars, harbor sounds, Walla, crowds of people passing through the streets and alleys, car traffic, street musicians, both close and distant emergency siren sounds, as well as the quiet crowd at the Istanbul Museum of Modern Art. Analog Days contains 390 sounds extracted from old portable cassette players, Retro WW tube radios, vintage turntable vinyl record players and retro tape machines. Here you can find a wide range of radio static and motor hum noises, manual tuning and radio transmissions, spring clunk buttons and knobs, vinyl record scratches, tape transitions (rewind, fast forward, play, stop) as well as the tape sounding through the little labyrinth of rollers and pins – all analog. UI Sounds: Musical is a collection of 300 sound elements ranging from subtle to glitch and juicy, vibrant sounds, which are ready to use in any kind of electronic user interface environment (smartphone, tablet, desktop app, web based app or site), smart TV app, wearable device app, UI demonstration videos, infographics, as well as in your games. 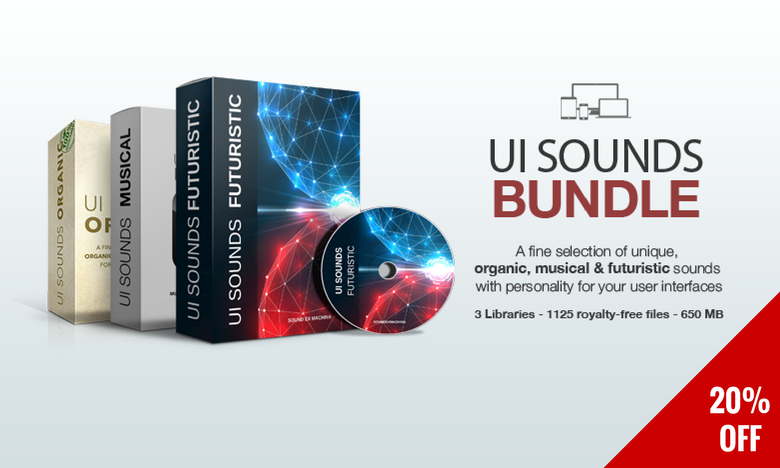 UI Sounds: Organic is a well-organized collection of 425 selections ranging from simple and discreet to catchy and jolly sounds ready to use in any kind of electronic user interface (smartphone, tablet, desktop app, web based app or site), smart tv app, wearable device app, UI demonstration videos, infographics, as well as in your games. Water Flow collection contains recordings of stream, river and small waterfall sounds, with close and distant perspectives of slow and turbulent flows. More than 80 minutes of high quality (24bit/96kHz) material recorded at various locations and delivered in an easily downloadable .zip file. Laughs is a toolset of 380 laughs containing a large laughing audience with more than 200 persons, having a really good time, cheering and applauding, including multiple smaller groups of people laughing, specifically designed to be varied in age, style and gender and featuring individual laughing performances by 25 unique voices. Kitchen Sounds is a Foley sound library containing high quality sounds from a professional kitchen you can sync to any visuals. Here you will find recordings from kitchenware arrangements, food preparation, water sink chores, kitchen cabinets, call bells and kitchen machine in operation (mixer, refrigerator, absorber, lemon squeezers, induction hobs, espresso machine e.t.c.). The sounds are royalty free and licensed to you under this license agreement. Want to try them out first? Grab the free versions! There are also the free lite versions of almost all libraries, which you can download by simply entering your email address below. Right after that, we’ll email you the download links. You can use those sounds in both your free and commercial projects. You’ll also subscribe to our list for updates on new sound libraries. Are you already subscribed to our newsletter? To stay up to date on our latest free libraries just enter again your email in the subscription field above and click to update your profile. Shortly, you will receive an “Update your preferences” email containing the download links of all our free libraries. We also provide customized sounds, tailored to your needs. If you have a special project in mind, just drop us a line.